The energy leaving a surface on unit area and per unit time. Lighting calculation algorithm wich have the same word – “radiosity” comes basically from the law of conservation of energy and “Energy balance” hypothesis. Let’s consider a simple example (of the 4 walls of the room in 2D). Suppose that one of the walls of a rejected the amount of energy (light) in a very short period of time (and here is extinguished). The law of conservation of energy says that all the energy that was radiated this wall will remain inside the room. For the emitted light, this means that it is all come to the other 3 wall. After this a some amount of a light can be absorbed, it depend on the surface type and other reflected, and one more time repeat, and repeat.. That mean, in a closed room (closed system), all once radiated energy goes into heat with the passage of time. Thus, the term “energy balance in the system” to have actually merely means that the level of illumination in the scene does not change with time. I.e we can ignore the time and consider the “instant” solution! 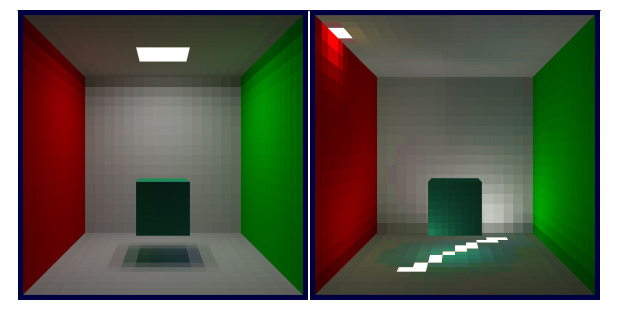 Radiosity algorithm works in terms of energy transferred between small areas(patches). Surfaces scenes are divided into a finite number of sites. Patches are small but finite size and is made up of several consecutive steps. The light sources are also interpreter as patches, radiating energy. energy of their energy patch i should come to any other patches. I.e amount of form factors in the row must be equal to 1.
calculation and decision system of linear equations. Once the total emitted by each site is known, can be visualized lyse scene. 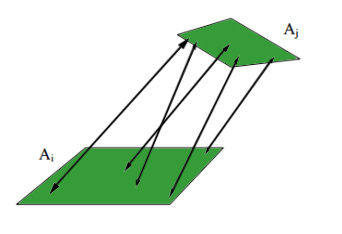 As Lambert material radiates energy equally in all parties, in order to calculate the brightness of the areas should be divided the energy of each site on its area. 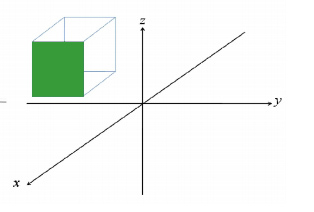 As the basic geometric element is proposed to use lined on the axes rectangles (Axis Aligned Quad). This primitive defines direct rectangle, located in 1 of 3 planes – XoY, XoZ or YoZ. It can be set as 𝑃 position and size in 2 directions perpendicular to the normal vector 𝑛 – 𝑛 rectangle at normal XoY can either be (0,0,1) or (0,0, -1). With such a primitive enough to easily search-beam. Suppose you have a ray starting at point and the direction 𝑂 𝐷. And there is a plane YoZ. Then parametric coordinate 𝑡 point of intersection of the beam and the plane will be equal Tℎ𝑖𝑡 = (𝑃.𝑥 – 𝑂.𝑥) /𝐷.𝑥. In order to understand whether or not your beam is rectangular, you will check whether the found point is crossed (expressed as a straight line from the equation 𝑃ℎ𝑖𝑡 = 𝑂 + 𝐷 * Tℎ𝑖𝑡) within the boundaries of the rectangle. The relative positions of patches. Complete the form factor for a given patch will be equal to the integral of the differential of the form factor on the area under consideration patch. Thus, we have made the transition from all points of the scene to the form factor between two specific sites. It remains to learn how to calculate the double integral over the surface. Very simple but long ray tracing and the Monte Carlo method. In the case of form factors should be N times to generate 2 random points on the floors, to calculate for each pair of points differential form factors and the results averaged. The result should be multiplied by the area of the two areas. 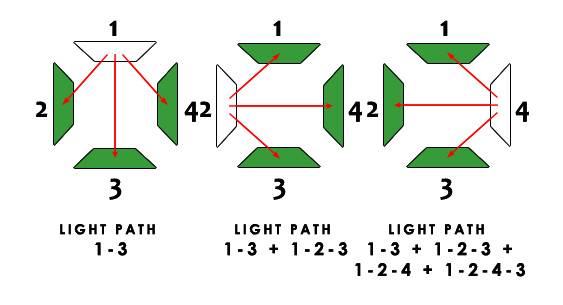 intensity and position of the camera. 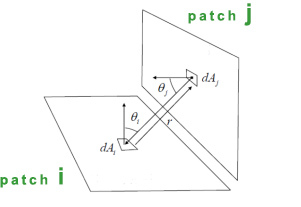 patches i and the k, j, and by combining the k patches, we can calculate the form factor for the pair patcheyy and patch, which is a union of patch j and k. This property will be useful in the implementation of the hierarchical radiosity, when a group of distant sites can be considered as one big playground. The sum of all the possible form factor for each patch equal to the scene per unit. All the energy, leaving the patch must come to some other patch. The algorithm is a direct calculation is quite simple. At each iteration, for each site It is going all the incoming energy. At the end of the iteration is multiplied by koefiftsient reflections and converted to outgoing energy for the next iteration.